PHOTO BY KEN MOORE. 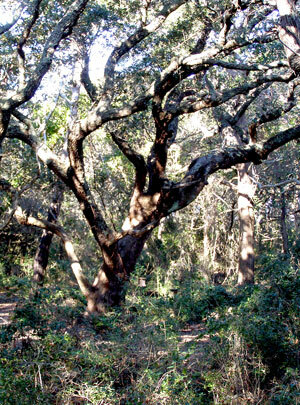 One of many old live oaks of Springer's Point Preserve on Ocracoke Island. What do Springer’s Point on Ocracoke Island and UNC’s Battle Park have in common? English ivy, Hedera helix – that’s what they have in common. A decade ago, I first visited Springer’s Point, where there is a mature live oak, Quercus virginia, forest, an example of the maritime forest once common along southeastern coasts. The historic “haunt” of the pirate Blackbeard was under invasion. English ivy was literally dripping from the tree canopy, where copious seed production was evident. The evergreen vine was smothering the smaller trees and shrubs beneath the big oaks. It was a scene of approaching disaster. Fortunately, that forest has come under the stewardship of the N.C. Coastal Land Trust (coastallandtrust.org), which purchased the first portion of Springer’s Point Preserve in 2002. Since then, the 31-acre preserve has grown to 122 acres. Ivy was introduced by early European settlers and commonly planted on island gravesites. The ivy that adorned the memorial site of Norfolk industrialist and Ocracoke philanthropist Samuel Jones and his horse, Ikey D, gradually escaped and spread throughout the forest. The Land Trust contracted with an invasive plant-control firm to remove the ivy and rallied volunteers from the island and nearby mainland. The forest is now healthy, and the ivy is confined to where it covers Sam Jones and Ikey D.
On the local scene, the Botanical Garden has been pulling English ivy for years. Staff and volunteers have removed the ivy from Coker Arboretum and continue to battle it in the Coker Pinetum and the forest near the Visitor Education Center. In recent years, the battle has appropriately moved to UNC’s Battle Park Preserve, which is under the care and management of the Botanical Garden. English ivy is just one of many exotic invasives that, over the years, have succeeded in disrupting the health of this once magnificent forest. 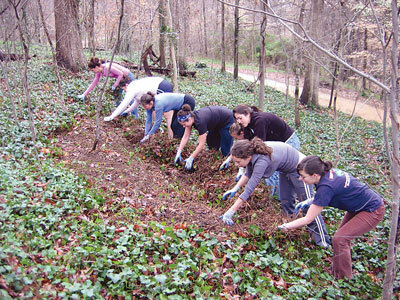 Under supervision of curator Stephen Keith, university work-study students and volunteers apply themselves almost weekly to literally rolling up tons of ivy to return the Battle Park forest to its former health. This effort is ongoing and seeing real results is enjoyable. If you’re not inclined to reclaim your own yard, please at least help by cutting all the ivy vines growing up your trees. When ivy reaches the upper limbs of trees it flowers and produces berries from which birds distribute seed far and wide. • Triangle Land Conservancy’s two invasives workshops scheduled for Jan. 20 and March 5 (triangleland.org). It’s time to get involved doing your part at home or with others in the community. Email Ken Moore at flora@carrborocitizen.com. Read more Ken Moore Citizen columns at The Annotated Flora. PHOTO BY KEN MOORE. 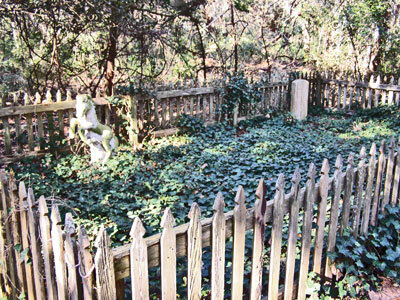 Once rampant English ivy now confined to gravesite of Samuel Jones and his horse, Ikey D.
Members of UNC’s Episilon Eta, the nation’s first environmental honors fraternity, “roll up” English ivy in Battle Park. Photo by Stephen Keith.